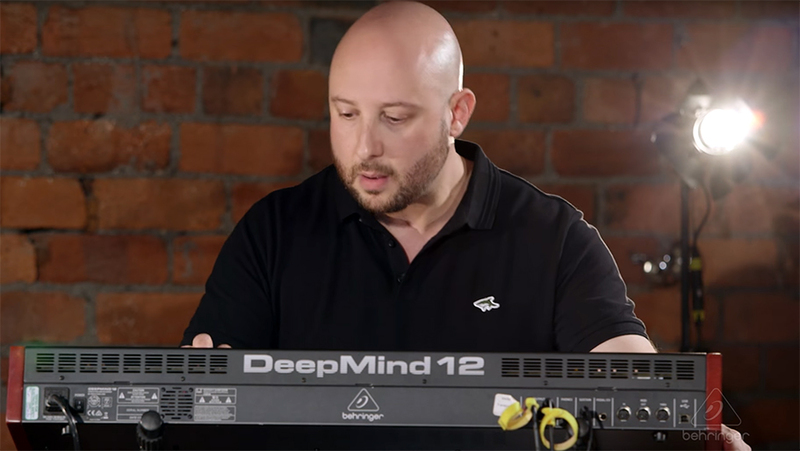 Whilst taking care of all UK and some European video output for Behringer, I acted as director of photography, camera operator, producer and editor for a shoot to launch the new Deep Mind 12 synthesizer. The idea behind this particular shoot was to get away from the standard, “hands on the keyboard – listen to this” demo that is usually found on YouTube. We wanted to demo the synth in a real band situation to emphasize the versatility of the synth. Pete, who leads the development team already had a contact in Dan Goldman aka JD73, a prolific jazz/funk keyboardist extraordinaire from Leeds. 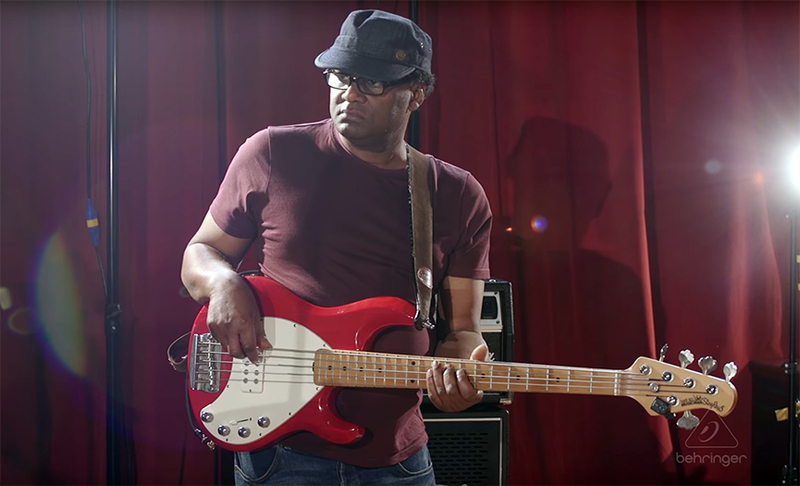 Dan could bring in his band: Hamlet Luton – Bass, Johnny Heyes – Guitar and Erroll Rollins – Drums. The lads would be performing one of Dan’s tracks. 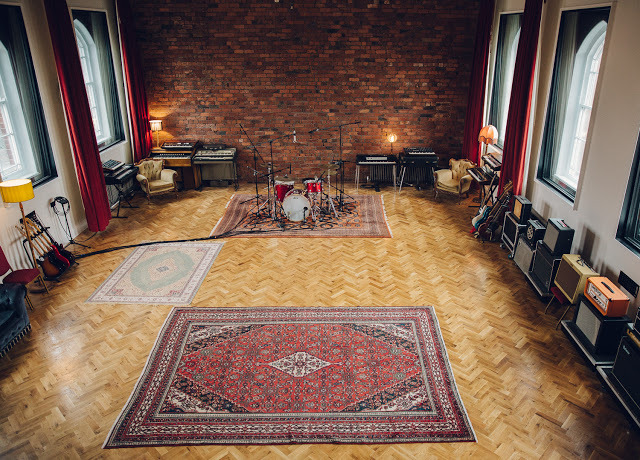 Bare brick, exposed beams, velvet curtains, wooden floors, Indian rugs and every classic, valuable piece of vintage music gear you could imagine. – Absolutely perfect! Andy is a pretty low temperature dude, but also extremely busy. The studio is generally booked up for about 3 months in advance so get in quick if you want to use it! There were enough details and images on the studio’s website and from Andy for me to plan the shoot without a visit, so I sketched out the dimensions, lights and cameras on my set planner. This needed to be a multi camera shoot and was quite tricky with limited space. I had a specific look in mind so designed the lighting accordingly. I decided to go with 6 cameras. Camera one on keys (over the shoulder – me), Cam 2 covering guitar & bass (Ben), cam 3 frontal mid shot of keys (Deryn), cam 4 on slider covering drums, guitar and bass, cam 5 overhead on drums, and finally camera 6 in the gallery for the safe shot (this camera didn’t make the final cut). Only three of us in the crew, so an early start and crack on with the lighting. Andy had a “dirty” electrical supply at the studio so we wouldn’t interfere with the audio. Andy got to work on the audio prep while we rigged up. The musicians arrived at about 10:00 am, so they got to work setting up and everyone just worked around everyone else, with me on synchronization duties. 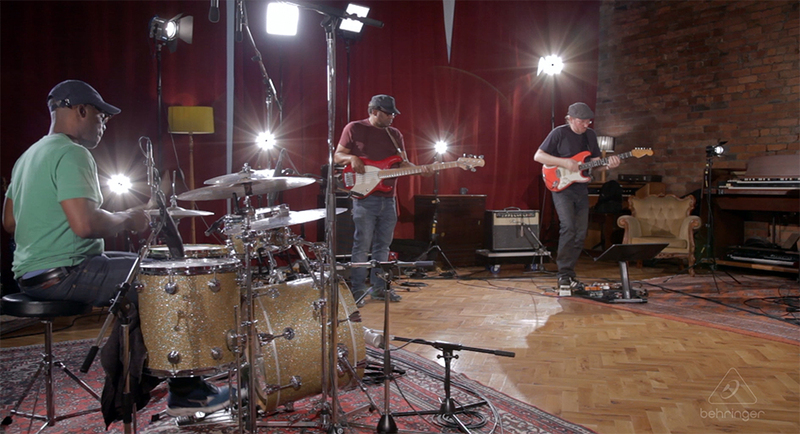 The musicians on this shoot were seasoned, session pros so happy to be placed and shoved around (thanks lads!) and just got on with the job. Andy got on with his job which was to multi-track and mix the audio. The track was recorded live with no fold-back, cans or overdubs. Not an easy job, but Andy is a pro. By about 1:00 pm the lights were in, spotted and focused, camera supports were in and musicians mic-ed up. Gear wise I used a Canon C100 Mk2 with 24/105 L series lens, Ben used a C100 Mk2 with 70/200 L series to cover bass and guitar, Deryn used a Canon C300 with 70/200 on the long/mid of Dan on the keyboards. The wide slider shot was a Canon 5D mk2 with 24/105 L series , drums overhead was my Canon 60D and the wide overhead was a Sony FS7. I loaded up a Cinestyle profile to the 60D and matched the 5D to this and set the 2 C100s and C300 to a matching profile. I then dialed in the white balance to the look that I wanted and transferred that to the other cameras. I wanted a fairly loose look to the shoot so directed the crew accordingly. With only three of us we had a lot of work to do between takes to reset the remote cameras and slider etc but both Ben and Deryn worked their socks off all day. To tie in all of the audio to the video for the edit, I recorded guide tracks to each camera and clapped a sync point before each take. I would then perform an auto line up on all audio (including the finished mix from Andy in the control room) within Premiere CC. I wanted record as many takes as possible and I think in the end I had six or seven takes that we could take into the edit suite. I didn’t want any cheats in the final edit like taking parts from one take and fudging it into another. Without a vision mixer in the crew or anyone monitoring the cam outputs I just had to hope Ben & Deryn were getting what I needed, – they did. 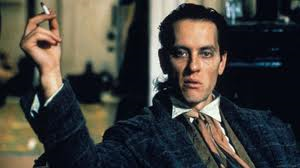 It’s all very well getting it technically perfect on our end, but if we shot a perfect take we also had to hope the musicians were happy with their performances otherwise they would want to scrap that particular take. – Hence the need for so many takes – just to be sure. I have to speak about the musicians for a while, these guys were just fantastic. 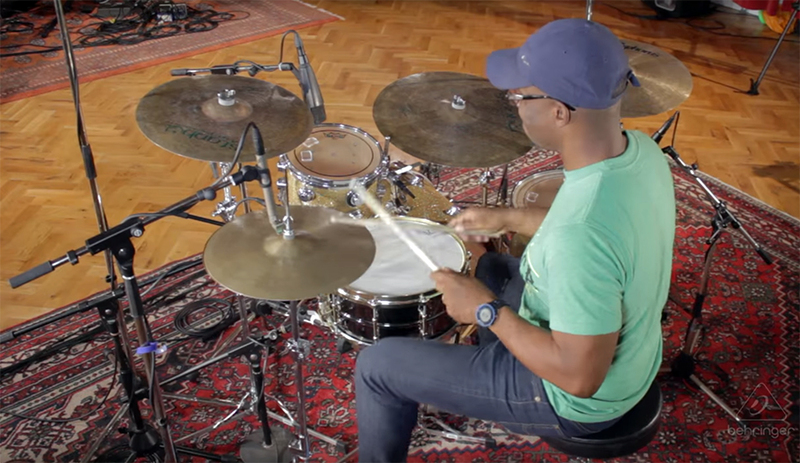 Watch the finished edit and check out the skill levels on show here, Erroll Rollins is absolutely rock solid on the drums. Really simple and effortless (watch how he starts and also pay close attention to his solo/breaks in the middle – incredible). Hamlet Luton is on bass duty. How cool is this guy?The riff that comes in about 5:17 is just immense and plagued our heads all day, all night and then the following day! Johnny Heyes is on guitar and the subtlety in his playing just blew me away. 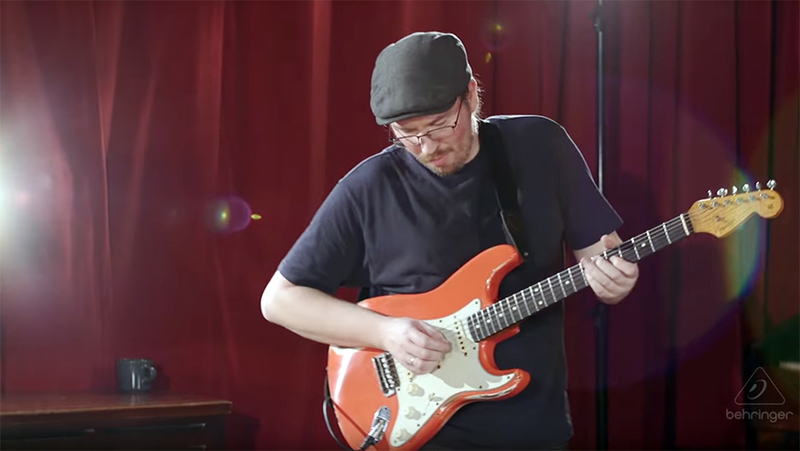 Master control of the wah-wah and doing just enough when needed. Check out his syncopated break at 5:46, incredible. Then there is Dan Goldman on keys. Dan has lots of videos up on his YouTube channel to check out and is the master of improvisation. On this occasion though he’d planned out pretty much exactly what he wanted to do. Check out the extraordinary run at 5:02 (!). All in all Dan had crafted a tune that ebbed and flowed from gentle piano to pure funk and back again effortlessly. In the edit suite I had a pretty big task ahead, ingest a ton of footage from six cameras in full HD, then split it into takes, rename all cam feeds and sync up. Once all this was done I had to work out which was the best take in terms of video technicality and looks. I had an idea about the best musical performance but ultimately Dan and the band had to be in agreement on this one. Luckily opinions matched up so we could scrap the other takes and get to work. Andy needed a couple of days on the mix from The Nave so in the meantime I just worked to camera audio. I used the multi-camera function in Premiere and mixed the cameras on the fly until I had it looking how I wanted. 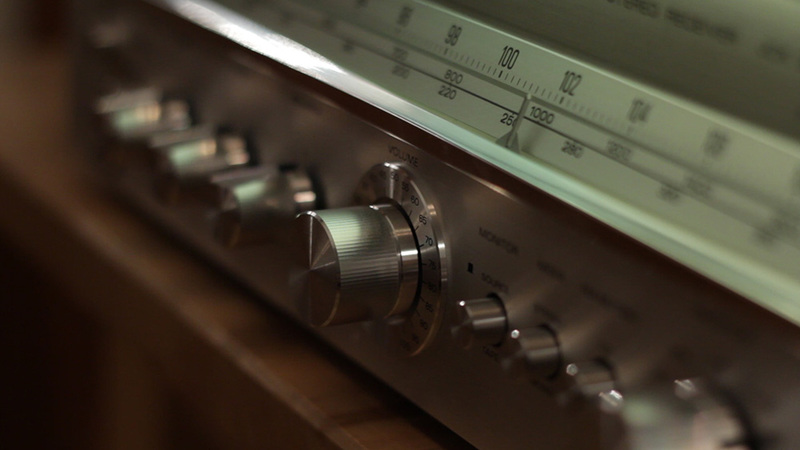 I then just graded it and it was ready within a couple of days of the shoot. I hope you like the finished edit. By about 5 or 6 pm we had it in the bag (hopefully) and everyone’s happy. The band could go home while we cracked on with shoot 2 with Dan – “DM12 Funk & Soul patch demonstration”. Dan had written some patches for the synth which would ship within the presets upon release. I re-rigged the kit so that we could record a multi-cam shoot of Dan demonstrating the patches. The finished edit can be seen below. At about 10 pm we attempted to go for a third shoot, layering track with the TC looper. The looper didn’t really perform as expected with the synth so as me and the crew were falling over after a bout 14 hours straight we decided to call it a night at about 11. ….Well, possibly, but I mean in terms of technology…. things were made a bit better and technology was becoming accessible. New tech wasn’t so much of a “throw away” item as it is today, knocked up in a factory with the cheapest components possible and cheap, lightweight casings. Yes I know we all want things to be cheaper, lighter, faster, and generally more accessible but wasn’t it great when there was no internet and you used to desire that “thing” you’d seen in the shop window. Then after harassing your mum for as long as possible for the money to buy it (and failing), trying to work out ways to earn and save up. Yes… save up, until you could buy it! (disclaimer:Reel 9 does not in any way endorse the act of “saving”. Money is available instantly from multiple outlets such as “getyerloannow“, “telluswhenitspayday” etc. etc). If you were a youth in the late 70s or 80s then there really were only a few options. Paper rounds were a firm favourite, but it sure took a lot of cold mornings and nights with frozen fingers to get that “thing”, but didn’t we appreciate it when we did? 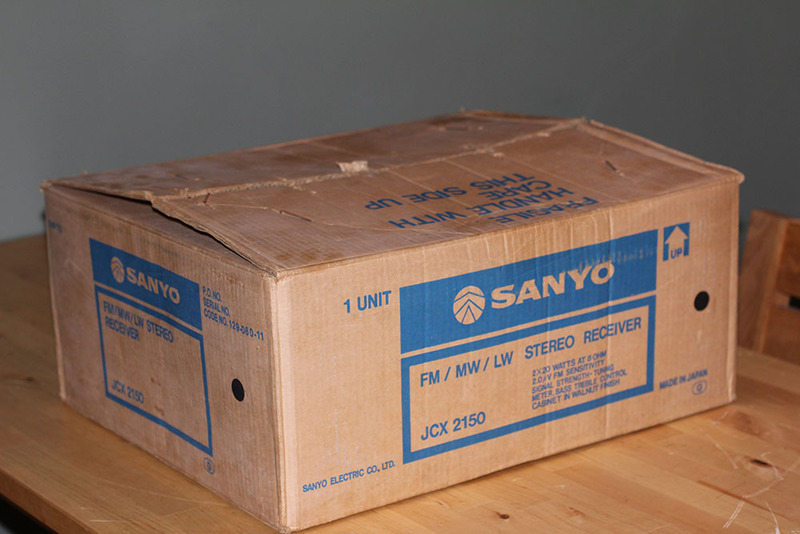 I think this is an older generation thing passed down, as I remember going round to mate’s houses (and my own) of course where dads were extremely proud and protective over their latest purchase…..“don’t touch it!” would be the cry from said “mate” as we admired in awe the new Sanyo/Sharp/Bush hi-fi his old man had just bought. I mean these were great things. 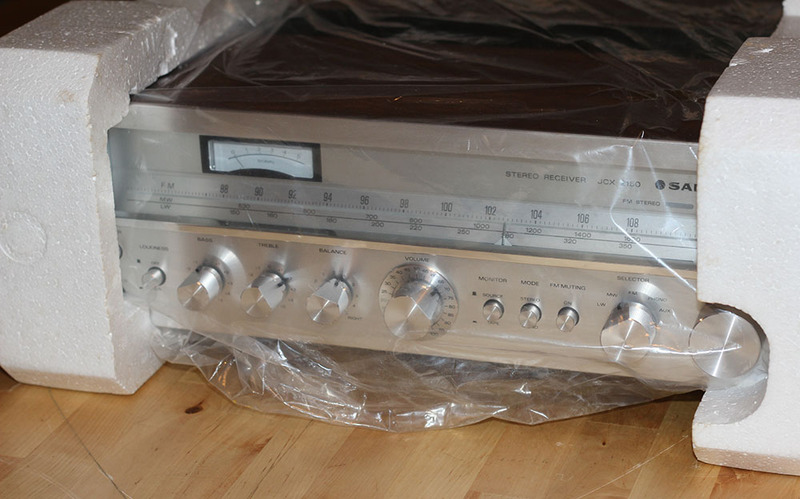 Silver…..brushed aluminium……wood…heavy knobs that turned…lights n stuff. These were things of beauty and woe betide you if you damaged another man’s Sharp. But, alas, these things are no more and we are resigned to settling for the latest plastic item purchasing that the marketing masters have convinced us that we need to make our lives better. A few of us though have started a revolution. We go to car boot sales and charity shops hoping to seek out those old gems of technology that remind us of our youth….but it’s becoming harder…”everybody’s at it these days”. And they are. What about when you used to get the “Loot” free ads paper and scour it before anyone else found that old Roland synth placed in the wrong section – “I’m avin that!” get round there and pick up a bargain. No chance anymore…we’ve got Ebay. Any old boys around that want to get rid of all their classic old stuff for peanuts?, no way, they’ve all been on Ebay pricing it up. If that’s not enough then you’ve got the car boot vultures…now these blokes are scary. Up at 4am standing in a field waiting for a car to arrive. Before you know it their face is stuck to the drivers window crying out in desperation “ow much for that Adidas bag in the boot mate?” The car hasn’t even stopped. I mean these guys are all over everything….records, old tech, hi fi, cameras, lenses, you name it. Then there’s the charity shops, they’re even pricing up from Ebay! “ooh look its a Yashica 70-200mm, stick £50 on it Marg..” Now don’t get me wrong, I want the shop to make money, but isn’t the whole point of going in that of trying to find a “bargain”? I mean I went into a charity shop last week and saw an old suit I quite liked the look of. It was wool and seemed quite nice in old suit kind of way. The price tag read £99.99. Ninety Nine Ninety Nine!!! for an old suit? So to drag you back to where I should have started without all of this rattling on I had basically given up hope of ever making a “special find” in time warp condition ever again, but then yesterday something happened. It powered up with a lovely greeney-white glow across the huge display window. I hooked up a CD player, stuck the aerial to the wall and hooked up some JBL Control 1s to test it. Now unlike your normal Hi-Fi where the volume control only goes up to 10, this one goes up to 100!, I knew that it was gonna be loud. Anyway it wasn’t as loud as I initially thought it might be but hey it is only 20W per channel. It sounded pretty good, so I carried on checking out the radio (rubbish reception up in them there hills I’m afraid) but it all seemed to work and generally sounded ok. I don’t think it will win any sound quality awards, but look at it….it is surely a thing of beauty in its own way. 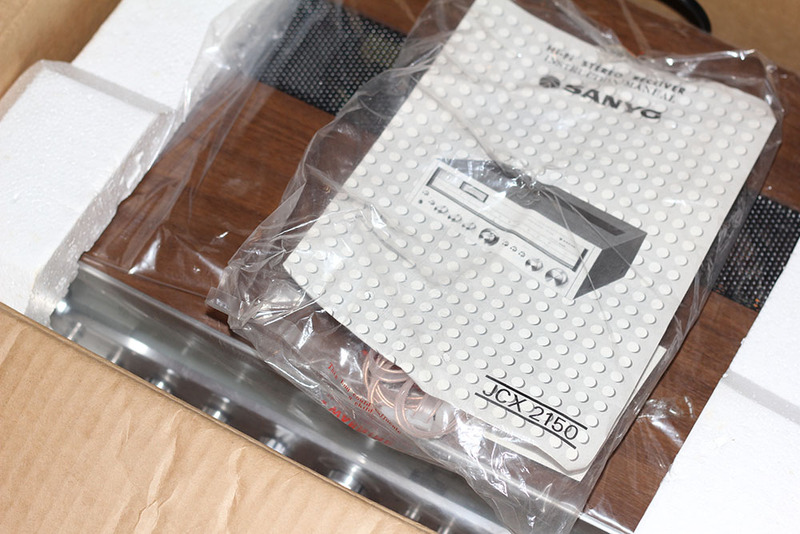 For a moment, taking this thing out of its box and carefully plugging it in, turning the dial to tune in the receiver, the weighted controls…I was transported back to the days of my dad’s old Sharp in the corner, listening to West Ham on the radio on a cold winter night in the European Cup Winners Cup. Never really got that dad…”cup winner’s cup?…what do you mean?”. What I’m going to do with him I’m not sure. It seemed a crime to awake him from his sleep, so I put him back in his bag…then his box….and then put him back to bed….for now.